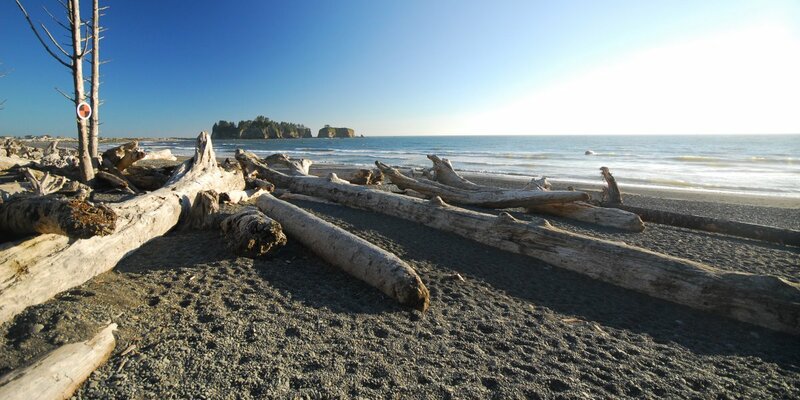 Olympic National Park is one of the west coast's most popular destinations, drawing visitors from around the globe. And despite its international appeal, there is still plenty of room to roam without fear of overcrowded trails and campgrounds. 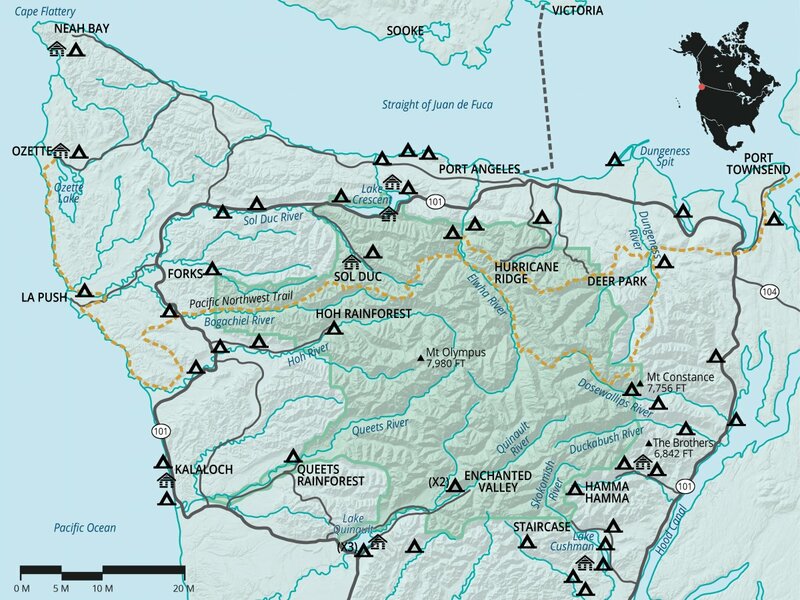 All of the campgrounds within the park's boundaries, with the exceptions of Kalaloch and Sold Duc Campgrounds, are operated on a first-come, first-served basis. However, due to the crowds at some of these campgrounds, they can be overrated. And with so many nearby "overflow" campgrounds that are often overlooked by tourists and are in equal proximity to the park's natural wonders, it's worth taking a broader view of the camping options in and around Olympic National Park. To get you ready for the summer camping season, we've assembled a complete guide to all of the established campground options on the peninsula. The list includes our favorite campgrounds, other campgrounds within the park, overflow camping options, and even the lodging options for those of you who may not want to sleep quite so close to the ground. And if you're planning to avoid car camping and would prefer to hike-in to a more serene backcountry campsite, we have you covered. Rialto Beach near Mora Campground. Photo by Tyson Gillard. Mora Campground. With 94 sites there is plenty of room for visitors, but unlike Kalaloch Campground, which is right off of Highway 101, Mora is quietly secluded, the sites are spacious, and by comparison they are more private. With nearby access to Rialto Beach, Hole-in-the-Wall and La Push's First, Second and Third Beach, you'll be in scenic beach paradise. South Beach Campground 55 sites. Open in summer only. First-come, first-served. Kalaloch Campground 169 sites. Open year-round. Reservations. Mora Campground 94 sites. Open year-round. First-come, first-served. Ozette Campground 15 sites. Open year-round. First-come, first-served. The Lost Resort + Campground 30 sites. Open year-round. Reservations. Hobuck Beach Resort + Campground 200 sites. 10 full hook-up RV sites. Open year-round. Reservations. Kalaloch Lodge + Cabins 42 cabins. 10 rooms. Restaurant. Reservations. The Lost Resort 3 cabins. Deli/grocery. Reservations. Hobuck Beach Resort 26 cabins. Reservations. Queets Campground. Photo by Tyson Gillard. Queets Campground. The setting along the Queets River, with towering old-growth surrounding the campsites, this campground defines the notion of being in the remote wilderness. With the adjacent Sams River Trail you will be able to keep busy, but be sure to bring provisions; you won't find amenities or potable water for miles. Oh, and did we mention that it rains almost every day for 8 months. Graves Creek Campground (Closed for 2016) 30 sites. Open year-round. First-come, first-served. No potable water. Queets Campground​ 12 sites. Open year-round. First-come, first-served. No potable water. Hoh Campground 88 sites. Open year-round. First-come, first-served. Willaby Campground 21 sites. Open year-round. First-come, first-served. Gatton Creek Campground 5 sites. Open in summer only. First-come, first-served. No potable water. Falls Creek Campground 27 sites. Open in summer only. First-come, first-served. Hoh Oxbow Campground​ 8 sites. Open year-round. First-come, first-served. No potable water. Bogachiel State Park Campground 26 sites. 6 RV sites (electricity and water). Open year-round. First-come, first-served. Lake Quinault Lodge 91 rooms. Restaurant. Pool. Reservations. Fairholme Campground on Lake Crescent. Photo by Tyson Gillard. Fairholme Campground. 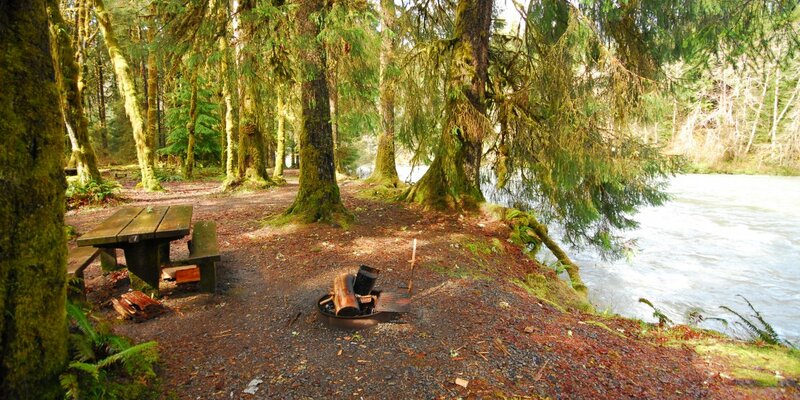 Located on the western shore of Lake Crescent, this campground offers large sites with direct beachfront access. Enough said. Sol Duc Campground 82 sites. 17 RV sites (electricity and water). Open year-round. Reservations. Fairholme Campground 88 sites. Open in summer only. First-come, first-served. Log Cabin Resort Campground​ 8 sites. 18 full hook-up. Open in summer only. Reservations. Altair Campground (Closed for 2016) 30 sites. Open in summer only. First-come, first-served. Elwha Campground (Closed for 2016) 40 sites. Open year-round. First-come, first-served. Heart O' the Hills Campground 105 sites. Open year-round. First-come, first-served. Klahowya Campground 55 sites. 1 group site. Open in summer only. First-come, first-served. Lyre River Campground 11 sites. Open in summer only. First-come, first-served. No potable water. Crescent Beach + RV Park 30 full hook-up RV sites. Open year-round. Reservations. Salt Creek Recreation Area Campground 51 sites. 39 RV sites (electricity and water). Open year-round. Reservations. Dungeness Recreation Area Campground 64 sites. 1 group site. Open year-round. Reservations. Sol Duc Hot Springs Resort 32 cabins. General store. Restaurant/deli. Massage/spa. Pool. Hot springs. Reservations. Log Cabin Resort 11 cabins. 12 A-frames. 4 rooms. Restaurant. Boat rentals. Reservations. Lake Crescent Lodge 55 rooms/cabins. Restaurant. Boat rentals. Putting in on Bear Creek Inlet, Lake Cushman at Skokomish Park North Camp. Photo by Tyson Gillard. Skokomish Park North Camp. 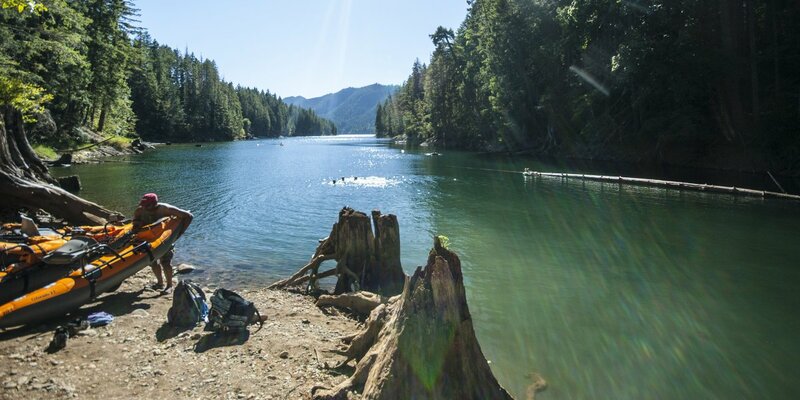 Just outside of the park's boundaries, the campground is ideally located on the eastern shore of Lake Cushman and has by far the largest and most private established campsites on the entire peninsula. Staircase Campground 56 sites. Open year-round. First-come, first-served. Restrooms and potable water only available during summer months. Sequim Bay State Park Campground 26 full hook-up RV sites. 15 RV sites (electricity and water). 52 sites. 1 group site. Open year-round. Reservations. Dungeness Forks Campground 10 sites. Open in summer only. First-come, first-served. No potable water. Fallsview Campground 14 sites. Open in summer only. First-come, first-served. No potable water. Seal Rock Campground 41 sites. Open in summer only. First-come, first-served. Collins Campground 16 sites. Open in summer only. First-come, first-served. No potable water. Lena Creek Campground 13 sites. Open in summer only. First-come, first-served. Hamma Hamma Campground 15 sites. Open in summer only. First-come, first-served. No potable water. 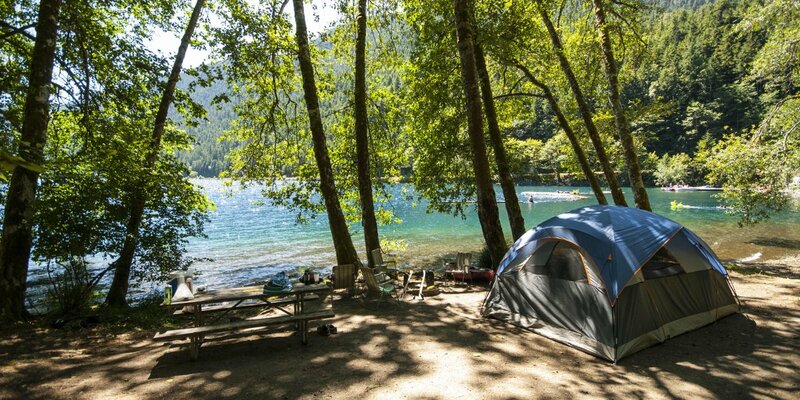 Lake Cushman Resort + Campground 47 sites. 14 RV sites (electricity and water). Camping open in summer only. RV sites open year-round. Reservations. Skokomish Park North Camp 30 sites. 1 group site. Open year-round. Reservations. Skokomish Park South Camp 31 sites. 35 full hook-up RV sites. Open year-round. Reservations. Laney Campground 10 sites. Open in summer only. First-come, first-served. No potable water. Brown Creek Campground 20 sites. Open in summer only. First-come, first-served. Oxbow Campground 30 sites. Open in summer only. First-come, first-served. No potable water. Potlatch State Park Campground 38 sites. 35 RV sites (electricity and water). Open year-round. Reservations. Hamma Hamma Guard Station 1 cabin. No potable water. Reservations. Lake Cushman Resort 11 cabins. General store. Restaurant. Marina. Boat ramp. 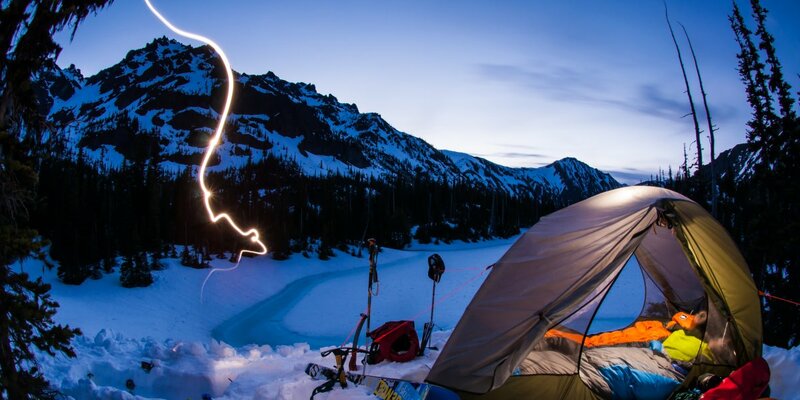 Backcountry camping at Royal Lake. Photo by Benjamin Krause. Due to the extensive length of so many hikes within the park, shuttling is often necessary. If you don't have two cars, you can hire shuttles to drop you off at your trailhead so that you can pick up your car at your end destination. All Points Charters & Tours offers shuttle services for hikers at roughly $150 for six people. Call 360.460.7131 for details.